Shuba pushes the boundaries of normative behaviour and practice both within organisations and in society. Influenced by a family of freedom fighters in India, Shuba’s ability to ‘think outside the box’ has led to innovative practices personally and professionally. She has an M.Sc. from the London School of Economics and an M.A from Bangalore University. 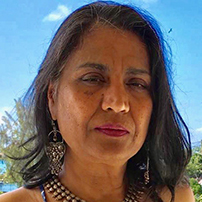 Shuba’s work spans non-executive and board positions, managerial roles, team facilitation, and entrepreneur, over 27 years in the UK, U.S.A, E.U, India, and Japan. Shuba is passionate about theatre, food and women’s health issues. She was the first woman in Bangalore to direct an “all-woman theatre production” through Bangalore Little Theatre. She received the “Healthy Eating award” on the Isle of Wight and has been featured in national newspapers and the Country Life magazine (in which the Editor cited her cuisine as warranting a Michelin star). Shuba’s current projects are on South Indian foods and women’s health while being an active proponent of educating young women on the prevention of “Pelvic Organ Prolapse”.